AAAP meetings are always free and open to the public. This meeting will take place at the Allegheny Observatory. Parking is also free. The AAAP starts the New Year with a sure-to-be fascinating lecture on the early life of stars. We tend to think of stars as very old, but all stars start out as infants and toddlers, so to speak. Our guest speaker for the club’s January 11, 2018 meeting is himself a young star in the field of astronomy: Ryan Muzzio, a first year graduate student in the Department of Physics at CMU. 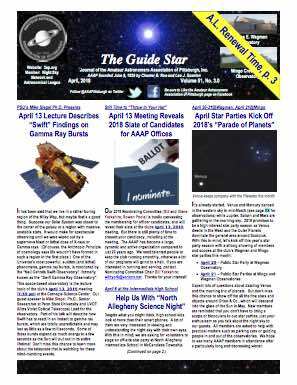 Unlike recent years, we hold our first meeting of the year at Allegheny Observatory rather than the Carnegie Science Center, but at the standard start time of 7:30 pm. The Usual Meeting Reminders: Of course, January can be an unfriendly month to travelers. If a major snow or ice storm is in progress on the 11th, we must cancel the meeting and schedule Mr. Muzzio’s talk for another time. Members can also check the AAAP’s Facebook page and 3ap.org web site for meeting status info. Parking is tight at AO, even when there is no snow on the ground, so please consider car-pooling so that we can squeeze everyone in. Totality lasts from 11:41 to 12:44 AM. Mid-eclipse is at 12:12 AM. Guests will also have the opportunity to observe other celestial wonders during this event. January 21 – Full Moon & Supermoon. The Moon will be located on the opposite side of the Earth as the Sun and its face will be will be fully illuminated. This phase occurs at 05:16 UTC. This full moon was known by early Native American tribes as the Full Wolf Moon because this was the time of year when hungry wolf packs howled outside their camps. This moon has also been know as the Old Moon and the Moon After Yule. This is also the first of three supermoons for 2019. The Moon will be at its closest approach to the Earth and may look slightly larger and brighter than usual. January 21 – Total Lunar Eclipse. A total lunar eclipse occurs when the Moon passes completely through the Earth’s dark shadow (or umbra). During this type of eclipse the Moon will gradually get darker and then take on a rusty or blood red color. The eclipse will be visible throughout most of North America; South America; the eastern Pacific Ocean; western Atlantic Ocean; extreme western Europe; and extreme western Africa. February 19 – Full Moon & Supermoon. The Moon will be located on the opposite side of the Earth as the Sun and its face will be will be fully illuminated. This phase occurs at 15:53 UTC. This full moon was known by early Native American tribes as the Full Snow Moon because the heaviest snows usually fell during this time of the year. Since hunting is difficult this moon has also been known by some tribes as the Full Hunger Moon since the harsh weather made hunting difficult. This is also the second of three supermoons for 2019. The Moon will be at its closest approach to the Earth and may look slightly larger and brighter than usual. March 21 – Full Moon & Supermoon. The Moon will be located on the opposite side of the Earth as the Sun and its face will be will be fully illuminated. This phase occurs at 01:43 UTC. This full moon was known by early Native American tribes as the Full Worm Moon because this was the time of year when the ground would begin to soften and the earthworms would reappear. This moon has also been known as the Full Crow Moon; the Full Crust Moon; the Full Sap Moon; and the Lenten Moon. This is also the last of three supermoons for 2019. The Moon will be at its closest approach to the Earth and may look slightly larger and brighter than usual. This event has been cancelled due to the forecast of inclement weather. April 22-23 – Lyrids Meteor Shower. The Lyrids is an average shower usually producing about 20 meteors per hour at its peak. It is produced by dust particles left behind by comet C/1861 G1 Thatcher which was discovered in 1861. The shower runs annually from April 16-25. It peaks this year on the night of the night of the 22nd and morning of the 23rd. These meteors can sometimes produce bright dust trails that last for several seconds. The waning gibbous moon will block out many of the fainter meteors this year but if you are patient you should still be able to catch a few of the brightest ones. Best viewing will be from a dark location after midnight. Meteors will radiate from the constellation Lyra but can appear anywhere in the sky.